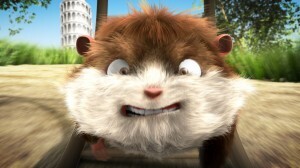 A hamster is chasing his love around the globe. Will he get her? Harry Fast was born in 1982. From 2003-2005 he studied Architecture, followed by studies in Cartoon and Animation at the ifs internationale filmschule in Cologne from 2004-2005. In 2005, he worked as an animation intern at the Berliner Film Company. Since 2007, he has been studying Animation at the Baden-Württemberg Film Academy. Jacob Frey was born in 1984. He studied Art and Design and worked as a freelance graphic designer before taking up studies in Animation at the Filmakademie Baden-Württemberg in 2007. He specialized in character animation and directing, working on many student projects as well as directing his own short films. Taking one year off from school in 2011, he gained international experience animating for Psyop in Los Angeles. His films include JIMBO CLEMENTINE (2008), BOB (2009), JELLY JEFF (2011) and his graduation film THE PRESENT (2014).